Sam comes from the rugged south-western coastline of Victoria, Australia, and is passionate about surfing, sustainability, and tourism. 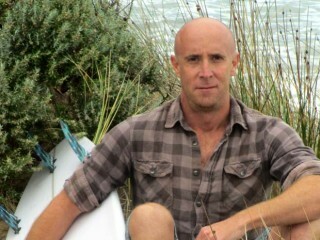 After growing up aboard his father’s yacht and sailing/surfing extensively throughout Indonesia and Australia, he jumped ship at the age of 18 and funded his surf travel addiction by working in a variety of roles such as commercial fisherman, marine security officer, and professional lifeguard/surf coach before becoming a qualified landscaper and establishing a successful sustainable landscaping business. After 20 years surfing, countless broken boards, a shed full of worn out wetsuits and first-hand experience of instances where surf tourism had resulted in negative environmental, social, and economic impacts, Sam faced a serious moral dilemma in reconciling his love of surfing and surf travel with sustainability. Giving up surfing was never really an option… making surfing more sustainable was. Sam is highly determined to advance sustainability in all facets of the surfing and surf tourism industries. Backed by a BSc Sustainable Development degree at Murdoch University and extensive on-site experience consulting for premier surf tourism operations, Sam launched consultancy firm ‘Refraction Sustainability’, which aims to facilitate the surfing community’s shift towards a more sustainable future.